Having her own personal e-mail server was simply a matter of convenience according to Ms. Clinton. It was too taxing for the Secretary of State to carry two devices: one for her government job and one for her personal e-mail (notwithstanding the iPad, iPad mini and Blackberry she carries). Maybe like the rest of us geezers, she was just not technologically astute enough to configure two two e-mail accounts on one device. Maybe she thought mixing both accounts on the same device would create a security problem. Now her use of a personal server has come to light and, in retrospect, she admits it was “a mistake” not to follow the policies of the government agency she led (the same policies that applied to all other employees but Ms. Clinton and her aids). She now admits that if she had known that a personal server would cause her so much trouble, she would have been glad to follow the law. No hidden motives, just a matter of convenience. What happens when convenience becomes the standard by which leaders operate? Sometimes it is convenient to go 25 miles over the speed limit. Sometimes it is convenient to cut in line in front of others who have been waiting (illegal immigrants included). Sometimes it is easier to fire an employee than to provide feedback and coaching. Sometimes it is easier to steal corporate secrets than do research. Congress won’t pass desired legislation? It’s more convenient to achieve goals by Executive Order anyway. Decisions are made by the Supreme Court without constitutional authority or without interpreting the law but rather because it “feels” right. The IRS targets “undesirable” charities because their beliefs were not compatible with the beliefs of those in charge. It was convenient to delay the processing and lower the staff’s workload. It was convenient to keep charities that are not agreed with from operating. These are only a few of many recent examples that could be cited in many federal government agencies, at all levels and regardless of party or affiliation. The ethic of convenience is pervasive. Stupid laws, rules, policies and regulations have always existed. But, in the past the accepted approach was to address the issue and change the law or policy. (A practice modeled by Dr. Martin Luther King, Jr.). Today the accepted approach is to ignore laws or rules that hinder, to behave as if they do not exist. Convenience has become more important than the rule of law or even moral absolutes. At a time when the government touts the philosophy of fairness, it is clear that many government senior executives see themselves as more equal than others (George Orwell predicted it correctly!). Of course the situational ethicist will say that Ms. Clinton’s indiscretions should be overlooked. After all, isn’t she the best chance for America to historically elect its first woman president? Isn’t it her turn? The situational ethicist will say that Ms. Clinton’s infraction is insignificant (even though a CIA agent was recently jailed for destroying one single e-mail. Also In the past month, the Department of Justice indicted a sailor who took a selfie in front of a sonar screen on a nuclear submarine and emailed it to his girlfriend). They will say that others have done the same thing (that argument sure never worked with my mother!). They will suggest that no harm was done (only the Chinese and Russians know for sure). They will argue that this indiscretion should be overlooked for the greater good (as interpreted by them). No one wants to see a seven decade old woman in jail but perhaps a leader who picks and chooses which rules applies to him or her has forfeited the right to lead. Does an ethic of convenience create damage? Leaders understand that actions have consequences. A leader cannot pick and choose which actions have consequences and which do not. Actions taken to achieve short-term goals (or conveniences) often create long-term consequences. (Isn’t this one of the biggest complaints of business leaders? – optimizing a company for the short term but sacrificing the long-term?). Ignoring existing laws or policies diminishes all laws or policies. If actions have consequences, then what is the impact of neglecting the rule of law or moral absolutes in the name of convenience? An example: over fifty years ago moral absolutes were removed from our public schools. Today, Time Magazine (May 26, 2013) reports that 60% of Millennials believe that they will be able to “feel” what is right when they face a difficult situation. “I will feel it when I face it!” Consequences! Principles that guide behavior in difficult situations are evaporating in front of us. Our situation is like the proverbial frog boiling in a pot of hot water. 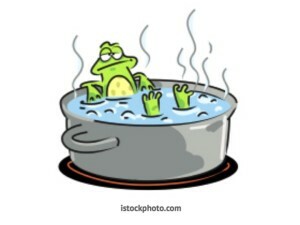 The temperature is heating up but we do not notice, or worse, we notice but rationalize staying in the pot. Are we moving to a future in which laws and rules apply to everyone else but me? Are rules and laws only to be followed if it is convenient? What will a nation be like when every person does “what is right in his or her own eyes”? No wonder we yearn for leaders who stand for something other than convenience. (Read LinkedIn posts any day: the theme of many is the lack of principled leaders). If the trend toward convenience continues, finding a principle driven leader will be harder and harder to do.